Bobby started playing drums when he was 11 years old. At 13 he joined a band called The Wanders, they played school dances and fraternity parties. Later in his teens, Bobby and his brother Teddy started there first band Tusk. Through his teens Bobby played the Long Island and New York club scene doing hundreds of shows. ''I was in a band called Samantha when Richie Blackmore asked me to join Rainbow''. 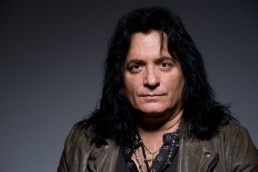 Bobby Rondinelli who is currently playing with guitar legend Leslie West (Mountain, West Bruce and Lang) and German guitarist Axel Rudi Pell is one of the most noted drummers in the industry today. He is a drummers drummer whose resume includes Rainbow, Black Sabbath, Blue Oyster Cult, Doro, Quiet Riot, The Lizards, Sun Red Sun, Rondinelli, Riot, Pyramid, The Sign, Zebra, Bonnie Tyler, Dee Snider, Classic Rock All Stars, Mark Stein, The Handful. 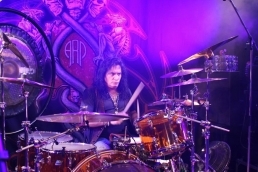 In addition to critically acclaimed solo projects Bobby has recorded with the Scorpions on there multi-platinum "Love At First Sting" and toured with Aerosmith and Foghat when their drummers were ill.
Bobby is also the author of the "Encyclopedia Of Double Bass Drumming" co-written with Michael Lauren. It features hundreds of innovative warm ups, beat and fill exercises, tips for getting started, a discography of important double bass recordings, plus a timeline of the most important double bass drummers in history. When not on the road Bobby maintains a busy teaching, recording and clinic schedule.